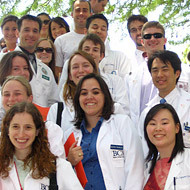 Think of the nation’s 186 medical schools as a club that just about every institution of higher learning wants to join. Texas physicians are pushing lawmakers on the importance of ensuring enough residency slots exist to train doctors who study in Texas and of preventing gun violence. As the number of hospital-employed physicians continues to rise in the United States, a new survey shows physicians are major drivers of revenue for those facilities. In the Capitol this week, Lubbock internist Cynthia Jumper, MD, urged budget-writing lawmakers to adequately fund graduate medical education so Texas won’t lose ground in physicians per capita. “It’s very much a buyer’s market for psychiatry residency graduates." More incoming residents are now choosing psychiatry. A record 1,556 U.S. positions were offered this year, including 93 in Texas. Is this good news for the beleaguered specialty? For Ali Sawani, attending the University of the Incarnate Word (UIW) School of Osteopathic Medicine was a leap of faith. The Texas Higher Education Coordinating Board approved the joint Texas Christian University and University of North Texas Health Science Center School of Medicine, expected to open in 2019. The board also OK'd the University of Houston's proposed allopathic school for a planned 2020 opening. A lack of standardization on APRN clinical training has the Texas Medical Association pushing the state to take a closer look. Read the Legislative Affairs story in Texas Medicine. Children's health got a big boost recently when the U.S. Congress passed House Resolution 5385, which extends the Children's Hospitals Graduate Medical Education Program for five years. An Austin physician group, one of the city’s largest hospital systems, and an outside hiring firm are engaged in a tug of war that pits corporate finances against the physicians’ view of what’s best for their patients, a three-month investigation by Texas Medicine magazine found. When Texas Christian University (TCU) and the University of North Texas Health Science Center (UNTHSC) announced they would establish an allopathic medical school in Fort Worth in 2019, one of the biggest concerns focused on new residencies. Without more residency slots, all those new medical students would be graduating into a state that already has too few residency positions to train new physicians. For the first time in 14 years, more women than men enrolled in Texas’ medical schools in fall 2017, an increase that reflects first-year enrollment figures nationwide. Does Texas Need More Medical Schools? Education debt is a growing problem that heavily influences which students choose the medical field and discourages many low-income and minority students. Can Texas' Physicians Be as Diverse as Texas? The United States and Texas have a chronic shortage of doctors, but the shortage of minority physicians is even more acute. To address this, and the health disparities that come with it, Texas medical schools are working to increase minority enrollment, but challenges remain. During the 85th legislative session, Texas lawmakers helped pave the way for two possible new medical schools, while ensuring that graduates have more options for residency positions. A recent study shows 2003 rules preventing residents from working long shifts did not translate to greater risk among general surgery residents' patients. The University of North Texas Health Science Center, Midland College, and Midland Memorial Hospital have joined forces to create an innovative model that links a community college, a medical school and a teaching hospital to prepare future doctors for this part of Texas. Read about the Permian Basin’s new Primary Care Pathway. Medical education is reinventing itself to keep pace with the changes in health care delivery. This special symposium issue on medical education examines residency training costs, the Next Accreditation System, graduate medical education in rural Texas, Texas' physician workforce needs, the current state of education reform, and efforts to retain medical graduates in Texas. To promote awareness of the hard work by Texas legislators to provide grant funding to expand graduate medical education in the state in 2016 and 2017, TMA initiated a forum for hospitals, medical schools, and other entities. Read about why TMA, the Texas Hospital Association, the Texas Higher Education Coordinating Board, and Teaching Hospitals of Texas joined forces for this endeavor.